We seem to have arrived at the end of April and what a month. April is known for being unpredictable here but I think we've beaten all records. I can't remember when it last rained. Certainly no April showers. The ground is dry and watering has become the priority when I should be focusing on sowing, planting and potting on. Established plants are fine but the newly planted and pots and trays need constant vigilance. Added to that we've had high temperatures, early in the month we were out in shirt sleeves and needing sun protection. Temperatures fell again and we had frosts, then on Tuesday night a fall of sleet/snow which settled and froze overnight. That added to the drought has resulted in a few things looking worse for wear though, mostly, I think they'll recover. The plants are confused and so is the gardener. In spite of all this the garden is blooming. I picked this branch of Clematis montana and brought it in hoping it would open more quickly. I've been looking at the fat buds outside for 2 or 3 weeks. They are just starting to open now but this came out in a couple of days. We had one of these in our previous life. It grew up the front of our house and was threatening to go under the roof tiles. Mr C pruned it one day to within an inch of it's life. It was never the same again and he has not been allowed to do pruning since, except under close supervision. I sometimes wonder if that was the intent? I salvaged some of last weeks vase. Mr C remarked on the height of the nameless plant, which had continued to grow all week, and said he liked it. This was unusual as he rarely notices flowers at all. 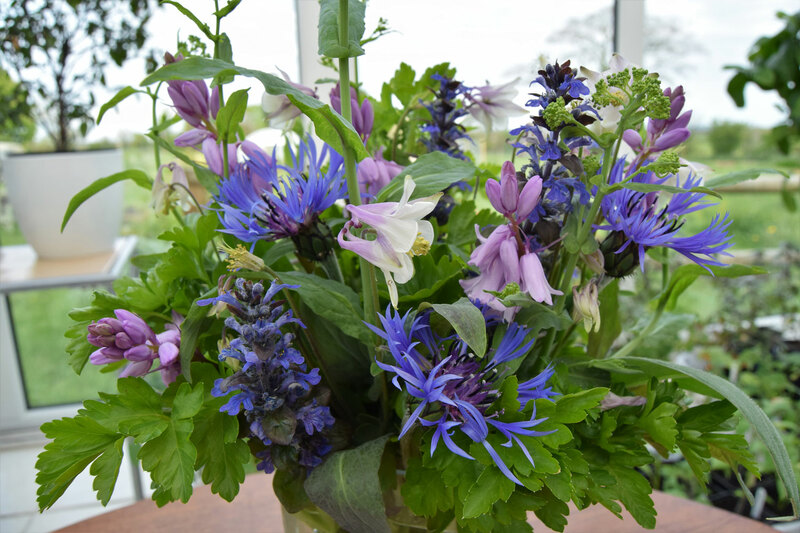 I salvaged that and the aquilegias and created this blue and pink concoction. I love these colours and I'm so glad I took a photo so I can remember to use them again. The pink tips on the aquilegia picks up the pink bells beautifully. Flat leaf parsley which is a brilliant bright green filler. Pink bells which have followed on from the white and blue. For inventive and creative vases from around the world visit Cathy at Rambling in the Garden - In a Vase on Monday. We've been building a chicken fortress for about 3 months now. It has taken longer and been more complicated than we imagined, nothing new there then. Mr C may not be a gardener but he is brilliant at construction and he's done a wonderful job. 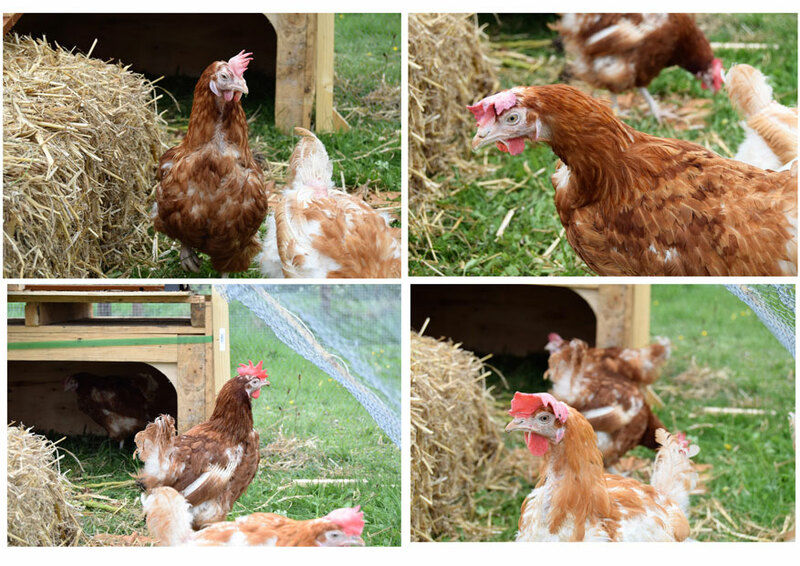 We got them through BHWT who re-home hens from commercial farms. Once we persuaded them outside they haven't looked back and are now enjoying retirement in their new home, scratching, pecking and laying. Some have more feathers than others but I think they already look more fluffy than they did last week. It was worth the days spent out in bitter winds trying to get the stakes in the ground and wrestling with a roll of 6' wire fence! 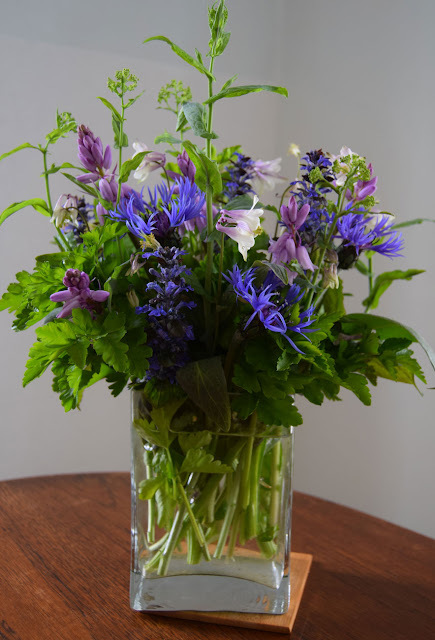 Lovely vases, blues are my favorite and the Centaurea is the prettiest one I have ever seen! I had to laugh about your husband as mine has similar restrictions. He is only allowed to cut grass. Thank you. Yes, grass is safe! We got all your April showers. Sorry about that. The colors of your blue/pink arrangement are harmonious, peaceful, and make a gorgeous display. 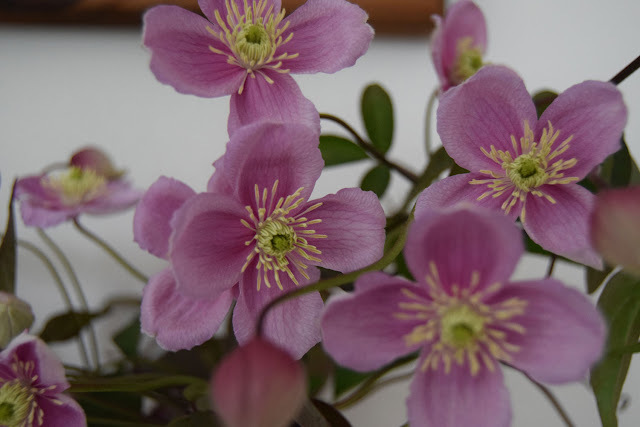 Hooray for Clematis montana and hooray for your new ladies. Thank you. The weather seems quite unpredictable. Rain all around us but not here. You have been riding a weather roller coaster! In contrast, summer is coming on here, whether we want to admit it or not. 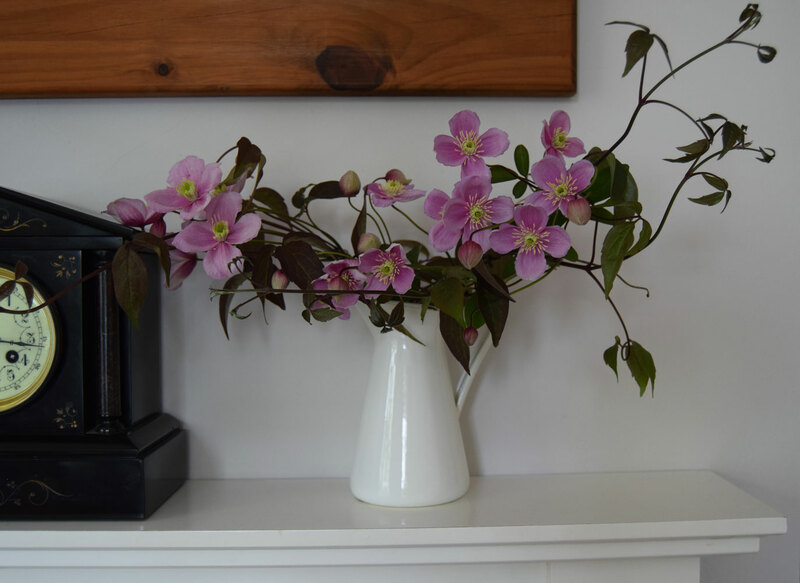 I love that delicate pink Clematis. 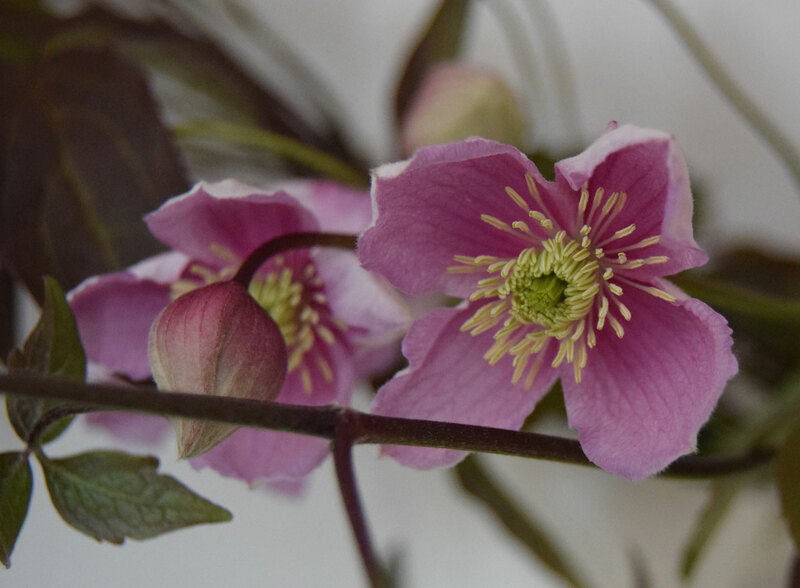 In fact, I love most Clematis, although I have only one. The chickens are a wonderful addition. I'd like to have some here but I'm unsure how to protect them from the local coyotes and I'm sure my cat would be jealous. I'm not usually good with clematis but I'm trying a couple more. I don't know about coyotes, our biggest problem is foxes who dig, climb and jump! As I said, we have built a fortress. I love the blue and lavender arrangement and the clematis is such a pretty pink. Kudos for your giving the gals a retirement in nirvana. Wishing them wellness and recovery from their previous enslavement! They are very happy, popped out immediately this morning and started eating grass, a week ago they had never seen grass. The clematis is lovely. Really love the colors of your second vase--so rich. We set records for rain in April. When it all comes at once like that I worry we'll end up in a situation similar to your soon where we have no rain. It's so distressing. I do hope you get some relief soon. Thank you. It's all to pot. We have to enjoy the weather here as once is starts it may well rain all summer! I think the problem must lie with using a tablet or phone because on my laptop it is never a problem, but I have to click on various pictures to prove I am not a robot - these don't apppear on the app versions. 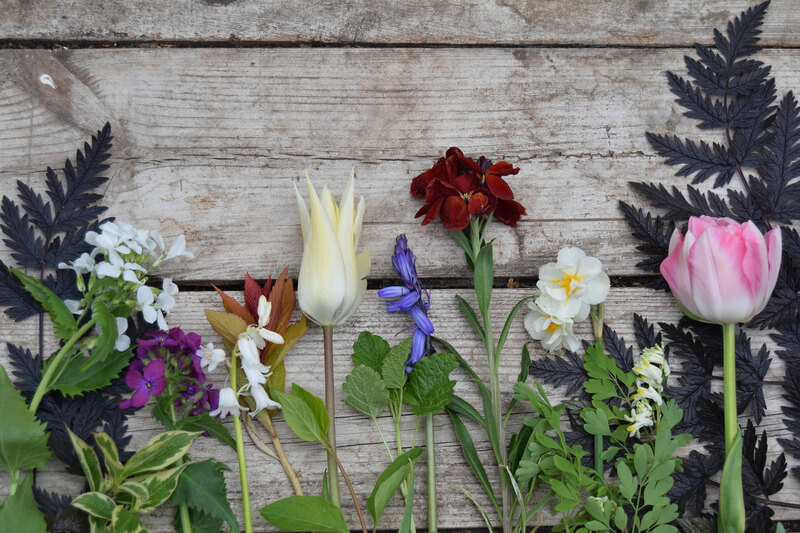 I am on my laptop now so hopefully this will post and when I have time I will google to see if there is a way round it because it is not just your blog that is difficult to comment on using a tablet. Now hat was I saying...? Oh yes, I was admiring your lovely clematis vase, then your second one and then your new chucks! I'm glad you made it at last. Thanks for persevering. I have looked for a solution but if you find one, do let me know. They are taking up lots of my time as I keep going to see what they are doing! 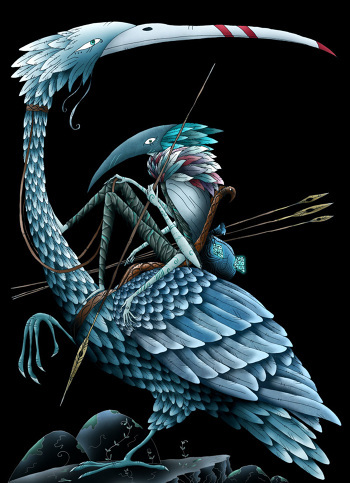 Pecking mostly. Thanks. I'm very pleased with the parsley and there is lots of it just now. Thanks, so far they are lots of fun and a huge waste of time!